Slow Cooker Black Bean Butternut Squash Chili and a Giveaway! Hope you all had a great weekend! Fall is definitely in the air here and one thing is for sure – the slow cooker sees a lot more action in the cooler weather. And with school and activities clogging up your schedule, it’s a life saver when it comes to getting dinner on the table, especially during the week. Hamilton Beach was kind enough to send me their Set & Forget 6 Qt. Programmable Slow Cooker With Spoon/Lid to try out. All I can say is, I LOVE it! The programmable option is wonderful. The lid clips onto the base which makes it easy to carry and take with you. And, it comes with a thermometer probe. All great things! This slow cooker is sure to free up your day to complete your long task list, and efficient enough to be ready as soon as your family sits down to eat. I bet you’d love to have one, right? Well, today is your lucky day. Just leave a comment on this post, telling me what your favorite slow cooker meal is. If you’d like a second entry, follow me on Instagram, and leave your IG user name in another comment. Want to increase your chances even more? Follow me on Pinterest and leave another comment with your user name. Giveaway ends on Monday, October 20th at 5pm EST. To participate, you must be at least 18 years old and reside in the US. Good luck! And even if you don’t win, try this recipe soon…it was a winner with us and it’s perfect for the fall! Combine all ingredients in slow cooker. Turn on high and cook for 3 to 4 hours. Toppings that work well with this dish are crushed tortilla chips, shredded cheese, sour cream, chopped cilantro, chopped scallions, avocados, and hot sauce! This entry was posted in beans, cheddar, cheese, chili, crockpot, freezer friendly, main dishes, make ahead, squash, tomatoes. Bookmark the permalink. 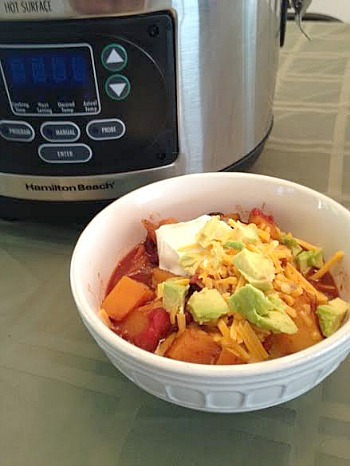 120 Responses to Slow Cooker Black Bean Butternut Squash Chili and a Giveaway! I love making shredded chicken for tacos….my all time favorite is cheddar beer chicken tacos! My favorite slow cooker meal is my tomato sauce with sausage and pork chops. It’s the best way to make a big pot of sauce! Ooh, a new slow cooker!! This recipe looks delish! I love making beef stew in the crockpot and it’s perfect for this time of year. That slow cooker looks amazing! Love beef stew in the crockpot but this recipe looks awesome too! I have three slow cookers that I use year round. Sadly, my first one I got is on its last legs so this new one would be a great replacement. My favorite slow cooker meal is minestrone soup. YUM! I follow you on Pintrest. I am abramos. Pot roast is a favorite in my house! Beef stew is my favorite to make in the slow cooker. I can’t wait to make this recipe in it though! I love beef stroganoff in the crock pot! I love making chili in the crockpot. I love three packet pot roast! Yum! So many great crock pot recipes, but I’m going to say potato soup! I love your crockpot Italian Chicken recipe. My favorite crock pot meal I make is beef stew! I love all different kinds of chili in the slow cooker! I love to make a whole chicken in the crockpot. It comes out delicious! We’ve been using ours so much lately that we’ve been thinking about upgrading. This would be perfect! I love making bread pudding in the crockpot! I think THIS recipe might be a favorite! This crock pot looks awesome!! I have a pork chop marsala recipe that I love making in the crock pot! Delish and easy! Can’t wait to make this! Love butternut squash! Following you on Instagram – lsvec0412. Follow you on Pinterest – lsvec0412! I love making BBQ pulled pork in mine! I make a bolognese sauce in my slow cooker that I absolutely love. And there’s nothing like the smell of sauce cooking all day on a Sunday! But I would love to make it during the week. 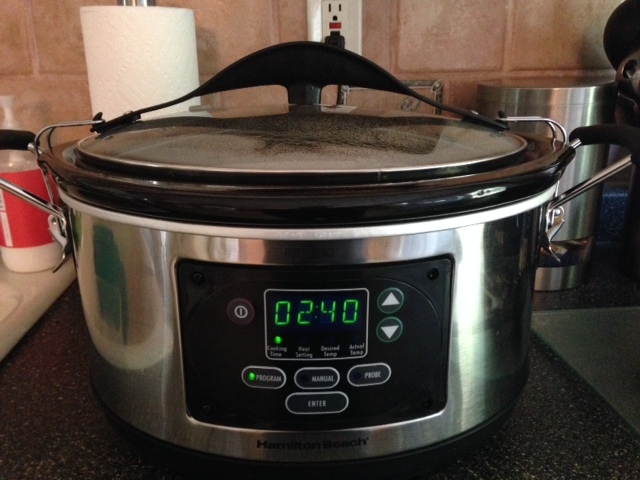 A programmable slow cooker would be amazing…! I love year round crock pot cooking! I would have to say my new favorite recipe is potato corn chowder. It changes frequently though. My favorite thing in the crockpot is a roasted chicken and then using the bones and left over goodness to make chicken stock and then chicken soup. my family loves crockpot chicken tacos! my fave is chili! I need a nice big slow cooker for that chili…. My fav slow cooker dish is Short Ribs. Favorite thing in the slow cooker is chicken stock! Turkey chili or salsa chicken! Absolutely love to do rump or chuck roasts in my crock pot. True comfort food. I love the classic pulled pork BBQ! I often make pulled pork sandwiches in the crockpot. 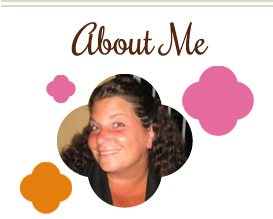 I follow you on pinterest as well! I love to cook pulled pork BBQ! I like making beef roast and stew beef with lots of vegetables and gravy. My favorite slow cooker meal is vegetarian chili. Slow COoker Lasagna is my favorite!! I’m following you on Pinterest! My favorite is slow cooker garlic and brown sugar chicken. I love crockpot cooking! Two of my favorites are lamb shanks and corned beef-YUM! I love making any type of soup in the slow cooker. I love to make veggie beef soup in my slow cooker. I’d love to have a programmable one because I just started a second job and now I don’t get home until 5:45pm. It’d be so nice to get the slow cooker started in the morning, then not have to worry about it all day! One of my favorite meals to make in my slow cooker is Creamy Italian Chicken! I love making shredded pork in bbq sauce and taco soup! I love making beef for french dip sandwiches in the crockpot! My favorite slow cooker recipe is the one in my slow cooker at the time. Currently: pinto beans with a cottage ham. I love a good pot roast in the slow cooker! I follow you on Instagram (SPLemonade). I follow you on Pinterest (@SPLemonade). bone-in turkey breast – my family LOVES it. I love making pulled pork BBQ! I LOVE making my roasted tomato and caramelized onion sauce in the crock pot. My favorite crockpot recipe is Sesame Chicken..yum!